The last couple of weeks have required our family to take a step back from home improvement responsibilities and focus on LIFE. With a weekly Gospel meeting at our church, school getting ready to start back up, work, last minute summer outings, etc. We just couldn’t invest much time with the hammer, paint, and floors. We also felt depleted in spirit learning about my sweet cousin, Kelli who lost her first child. A full term baby girl, named Kennedy Colleen. Our hearts have been so sad. My cousin, was so healthy and in an instant a form of preeclampsia took baby Kennedy and almost took Kelli with it. Thankfully, Kelli is recovering and we are grateful for prayers that have strengthened her body and soul during this time. Trying to get motivated again to PUSH ON with this Dirty Diamond can be a challenge. My sister had mentioned awhile back about our family applying for a show on the DIY network called “First Time Flippers.” So on Friday afternoon, around 1:00 pm I submitted a pretty vague application to be on the show. I also included THIS BLOG as a reference and my Brick and Mortar Wash video tutorial. Thinking the whole time…”slim chance.” At 3:45 pm, I received a call from New York. I listened to my voice mail and to my AMAZEMENT and HORROR (can you have both at the same time?) a young woman from the First Time Flippers show wanted to speak with me. EEEEKK!!!?!?!! My sister, Penny happened to be standing beside me when we both listened to the message on speaker phone. She grabbed my arm and her mouth dropped! I attempted to call the woman back and had to leave a voicemail. It was the weekend, so I kind of figured that would be the case. She also gave me her email address and so I emailed her back and told her I would make a video introducing ourselves and what the house looks like. We made the video Sunday. Jonathan was a good spouse and sat beside me. 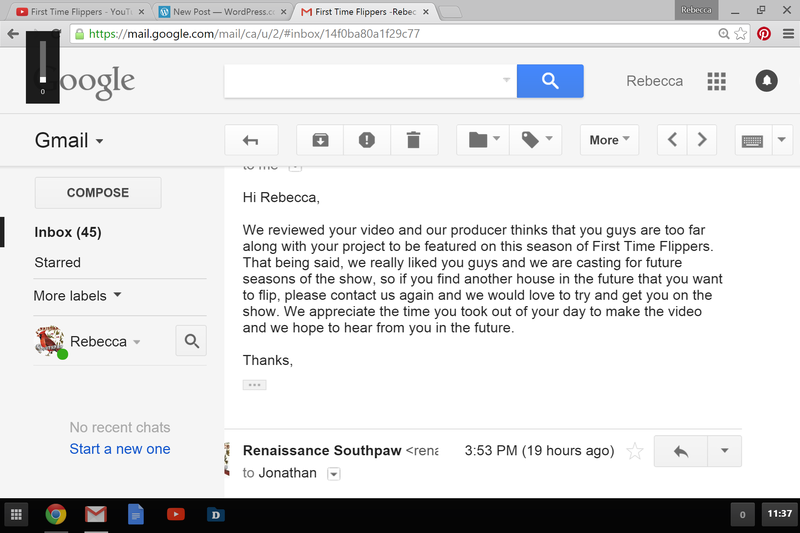 I submitted the video on Monday morning and the woman from the show “thanked” me for my promptness and said she would send it to the producer. EEEEKKKKK!!! I did wonder if we were too far along in our fixer upper? The shows that I have seen start with “DAY 1.” We would be like “DAY 186” or something like that. Plus, we are living in the house, while it appears many people fix it up to flip it within weeks to get it back on the market. Our intention is to live in the house while we build. Oh well! It was a fun and frightening idea to entertain over the weekend. Almost famous for one hour. You can watch our video here and also learn a little more about us, see more pictures of the project and how we tick. Wow Guys Looking good!! I think you may have your own show soon!! Keep it up!